In autumn 2001, Robert Goulter stood on a high point on Springer’s Block in the Howard Valley for the first time. He was overwhelmed by the peace and natural beauty of the property, which is located near the Nelson Lakes National Park in the heart of the St Arnaud Basin, and had a vision to increase its productivity. Pyne Gould Guinness Marlborough branch manager, Joe Blakiston, was there with Robert that day, and the two of them discussed the pros and cons of purchasing and financing the development of the 500 hectare breeding farm. “We were stunned by the beauty and potential it had. With views to the Rainbow and Mt Robert Range in the east, to the Nelson hills to the north-west, and the mountain streams coming out from Porika Hill, we could see what a beautiful property it would be to farm, and we thought we could increase productivity from the 500 stock units it was carrying at the time,” says Robert. Roll forward 17 years, Robert and wife, Heather, have called on Joe again, now the Tasman regional sales manager for PGG Wrightson Real Estate, to market and sell their farm, which has been largely developed according to the plans they began to formulate that day. “We have based development of the farm around taking trough water to most paddocks, and a fertiliser and fencing programme, along with new cuttings and roads. We have also established an Angus breeding herd, and a Perendale-Romney breeding flock,” says Robert. When they took over, the Goulters thought about coming up with a new name for the farm. However, the neighbours told them historically the farm was named Springer’s Block, after a Mr Springer who farmed it after World War II. Robert and Heather’s home farm is Hawkesbury, a sheep and beef and viticulture property 15 kilometres west of Blenheim, where they finish stock bred at Springer’s Block along with an Angus and Corriedale ewe flock. Continued development of that property, which was settled by the family in the 1850s, requires a greater share of attention, while the need to recalibrate the work-life balance has also played a part in their reluctant decision to sell Springer’s Block. “Springer’s Block has been a wonderful property for us, with great neighbours who have always been so helpful. It has been a joy to farm over the years,” says Robert. Thanks to their husbandry and development, its carrying capacity now sits between 1700 and 1800 stock units. “Springer’s Block’s current management system suits us fine, where we run it as a low-cost feeder unit for the sheep and beef component of Hawkesbury. All stock is finished at Hawkesbury, while at Springer’s, we concentrate on growing feed and bringing through good progeny. “Approximately one day a week ,our stock manager travels from here, keeping an eye on things, which has worked well, though someone living on full-time might be able to increase the capacity of the farm by a further 500 stock units, judging by the expected stocking rates in the district. “It is a wonderful summer farm, producing great balage each season, and the district is well-known for summer grass growth, while the supplements made keep the stock going through the cool St Arnaud winters,” he said. Springer’s Block’s two-storey chalet-style homestead, with three bedrooms, double glazing and an office, was built by the Goulters in 2003. “It provides a perfect escape and antidote from the frenetic pace of the wine industry, which takes up much of the rest of our lives. “You feel it the moment you turn off State Highway 63 onto the property. Looking out across the Buller River’s confluence with the Howard River, where the farm sits in a triangle, it feels like you are entering a different world. “We have spent many wonderful family holidays there, as well as seasonally working weekends on the farm. For a new owner, the homestead could also operate as an accommodation option for the likes of Airbnb or Bookabach,” said Robert. Off the grid, the homestead runs from a mini-hydro-electric generator, plus solar panels on the roof, complete with new batteries added in 2015. It is also wired for 230 volts in case power can ever be brought in from elsewhere. Farm infrastructure includes two sets of cattle-yards, one set of sheep-yards and a two-stand shearing shed with small covered yards and a hydraulic wool press. Around 100 hectares of Springer’s Block is in native bush, comprising red beech, black beech, rimu and native shrubs, populated by tui and bellbirds, as well as fallow and red deer. “As well as the farm, there are opportunities with the property to capitalise on its recreational amenity and aesthetic beauty, with the likes of horse trekking, mountain biking and hunting. 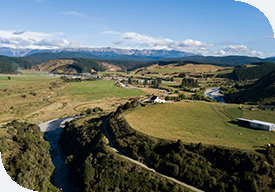 Previous owners had plans for a lodge, and there is a perfect site for that, with good access and views up the Buller River to St Arnaud, so a new owner would be able to proceed with that relatively easily,” says Joe Blakiston. Joe describes Springer’s Block as a rare gem. “What Robert and Heather have achieved is outstanding, the quality of the farm is apparent to all, and its amazing surroundings and vistas can’t be matched. While they have run it conservatively, to suit their commitments to their home farm, anyone able to spend more time on the farm would take its productivity up another notch or two,” he says. While it will be an emotional process for Robert and Heather, and they will part with Springer’s Block with heavy hearts, they are looking forward to seeing a new chapter on the farm. “We would be delighted to hand it on to a young farmer or couple, who can carry on with the property to help achieve its potential. It will reward time, effort and patience spent on it. It has been a pleasure for us to farm, and we hope it will give the next owners as much satisfaction as we have had,” says Robert. For more information, see page 43 of our latest publication, Property Express.